November 11 – 23, 2013, Warsaw, Poland was the venue for the 19th annual United Nations Climate Change Conference, also known as the 19th Conference of the Parties — or COP 19. The purpose of this conference was to create a loss and damage pillar of a new climate treaty to be finalized in 2015. The other two pillars discussed in previous meetings are mitigation (emission reductions) and adaptation pillars. The main outcome of the meeting was the establishment of an international mechanism for a loss and damage associated with climate change impacts . In 2009 at the semi-infamous Copenhagen talks, the rich countries made a deal with developing countries, saying in effect: We’ll give you billions of dollars for adaptation, ramping up to 100 billion dollars a year by 2020, in exchange for our mitigation amounting to small CO2 cuts instead of making the big cuts that we should do. The money to help poor countries adapt flowed for the first three years but has largely dried up. Warsaw was supposed to be the Finance COP to bring the promised money. That didn't happen. Countries like Germany, Switzerland and others in Europe only managed to scrape together promises of 110 million dollars into the Green Climate Fund. Developing countries wanted a guarantee of 70 billion a year by 2016 but were blocked by the U.S., Canada, Australia, Japan and others. It got to the point that hundreds of representatives from various NGOs walked out of the negotiating rooms to protest against developed countries’ reluctance to commit to a loss and damage mechanism. And this was a day after the G77+China group of 133 developing countries walked out of negotiations over the same thing. Looking through the briefing reports from the respected NGO, the Third World Network , It seems that on the surface, while an outcome was eventually thrashed out, there are many areas of weakness of sufficient vagueness to satisfy everyone that contentious issues that are seemingly resolved can still be challenged and changed in the future. Many years ago all nations agreed that climate change was largely the result of actions from today’s industrialized nations, as carbon dioxide — the main greenhouse gas — stays in the atmosphere for decades. Yet, the poorest would end up suffering the most for a problem they largely did not cause. The approaches to mitigation (emissions reduction) would therefore be different for those groups of countries — the common but differentiated responsibilities principle. It is in this context that the discussion for loss and damage has come about. And it is something that rich countries are keen to get rid of . The years of resistance on this issue (and many others) means each time it is discussed again the reactions seem to get even more hostile. Combined with the lack of detailed context in the mainstream media coverage of this aspect, it then becomes easier each time to see culprits as China and India given their enormous greenhouse emissions in recent years, compared to the far greater amount by the industrialized nations over the longer period. See this site’s section on climate justice for more detailed background. The meeting came at the time when the devastating Typhoon Haiyan had just killed thousands in the Philippines and affected millions more. It was an ominous warning of what could be more frequent as climate change continues to take hold. It was also an example of how poorer nations could be affected by a problem they have largely not been responsible for and that while all the international outpouring of aid and assistance was incredibly welcome, that support for preventing and adapting to such events is paramount and efforts are urgently needed to curb emission increases. In an emotional speech the Philippines lead negotiator for the conference, Naderev Saño, received a standing ovation for announcing that he will go on a hunger strike until a meaningful outcome is in sight. To have a good chance at staying under two degrees C, industrialised countries need to crash their CO2 emissions 10 percent per year starting in 2014, said Kevin Anderson of the Tyndall Centre for Climate Change Research at the University of Manchester. We can still do two C but not the way we're going, Anderson said on the sidelines of COP 19 in Warsaw. He wondered why negotiators on the inside are not reacting to the reality that it is too late for incremental changes. I’m really stunned there is no sense of urgency here, he told IPS. As the conference is still underway as this page is written, more information will be added here after the event is over. Below is a list of stories from Inter Press Service related to the Warsaw climate conference and its aftermath. ISLAMABAD, Apr 17 (IPS) - Pakistan, which has been listed as the 7th most vulnerable country affected by climate change, is now seriously tackling the vagaries of weather, both at the official as well as non-official level. Pursuant to an initiative launched by the Pakistan Parliament's Upper House, the Senate, which specially entrusted a sub-Committee of the Standing Committee on Climate Change to focus on "Green and Clean" Islamabad, media, civil society and students have taken up the cudgels on combating climate change. 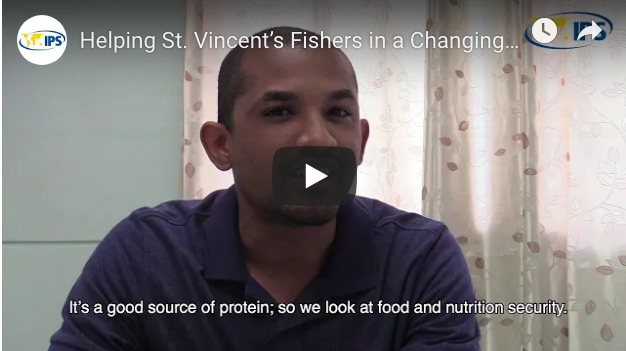 PORT-OF-SPAIN, Mar 28 (IPS) - Fishers in Anguilla saw posted on Youtube this week a video they helped produce that depicts the impacts of climate change on their industry. Titled "Anguilla's Fishing Dilemma", the four-and-a-half minute video highlights some of the main challenges Anguilla's 92 licensed fishers face in earning a living. UNITED NATIONS, Mar 19 (IPS) - The United Nations has vowed to eradicate extreme hunger and malnutrition on a self-imposed deadline of 2030. But it is facing a harsh realty where human-induced climate change – including flash floods, droughts, heatwaves, typhoons and landslides-- is increasingly threatening agriculture, which also provides livelihoods for over 40 per cent of the global population. CASTRIES, Mar 18 (IPS) - In 2015, the Caribbean was "the region that could" on the climate change scene. Countries rallied under the ‘1.5 to Stay Alive' banner, in the face of an existential threat. The now former Sustainable Development Minister of Saint Lucia Dr. James Fletcher emerged as a climate change champion at the time. But now, three years on, the scientist is giving regional climate action a C- in an assessment. ROME, Mar 16 (IPS) - Friday, Mar. 15, hundreds of thousands of young people across the world took to the streets to join the climate strike. "We are demonstrating today for our planet and for our future. This is the place where we and those who come after us will live," Jennifer, a 16-year-old girl from Rome, the Italian capital, was one of those who opted to join the protests rather than attend school, told IPS. LONDON / DHAKA, Mar 15 (IPS) - Jonathan Farr is WaterAid's Senior Policy Analyst on water security & climate change, based in London & Samia Mallik is WaterAid Bangladesh's Communications Officer, based in Dhaka. The stakes are high for women when faced with a warming world – their livelihoods jeopardised by labour markets that tend to put men first, their family responsibilities increasing rapidly in the face of droughts and flooding, and politicians who refuse to acknowledge the challenges they face. The story of those living on the frontline of a harsher climate is simply not being heard. KINGSTOWN, Mar 14 (IPS) - From an influx of sargassum in near-shore waters, to fish venturing further out to sea to find cooler, more oxygenated water, fishers in St. Vincent and the Grenadines are battling the vagaries of climate change. The country is doing what it can to respond. STOCKHOLM, Mar 05 (IPS) - The trade unions' solution for a greener world is new jobs with good working conditions. The critics argue that there's not enough time. "We can either protect industrial jobs in the global north or save the climate", says political scientist Tadzio Müller. MANILA, Mar 04 (IPS) - Kurarenga Kaitire lives in Kiribati—one of the world's most climate-vulnerable nations. Already vulnerable to nature, the 29-year-old mother of five has faced a series of vulnerabilities over the past decade, including facing social stigma and domestic abuse. PORT-OF-SPAIN, Feb 26 (IPS) - The Caribbean Climate Smart Accelerator launched last year June with the backing of Virgin's Richard Branson has given itself five years to help the region become climate resilient. BUENOS AIRES, Feb 25 (IPS) - Climate change poses a global threat to food production, but for agriculture in Argentina it could also present new opportunities. In some areas of the country, farming conditions will improve, according to an analysis by experts of the latest climate projections. BULAWAYO, Zimbabwe, Feb 18 (IPS) - The island state of Jamaica is vulnerable to climate change which has in turn threatened both its economy and food production. But the Caribbean nation is taking the threat seriously and it has constructed a robust policy framework to support national climate action, particularly when it comes to promoting climate-smart agriculture (CSA). PARAMARIBO, Feb 13 (IPS) - Suriname, the most forested country in the world, is this week hosting a major international conference on climate financing for High Forest Cover and Low Deforestation (HFLD) countries. GEORGETOWN, Feb 05 (IPS) - IPS correspondent Desmond Brown interviews DOUGLAS SLATER, Assistant Secretary General at the Caribbean Community (CARICOM) Secretariat. GEORGETOWN, Jan 28 (IPS) - The link between desertification, land degradation and climate change is among several issues occupying the attention of the 197 Parties to the United Nations Convention to Combat Desertification (UNCCD) for the next three days. BERLIN, Jan 18 (IPS) - Daniel Mittler is the Political Director of Greenpeace International and is on the steering committee of the global Fight Inequality alliance. Four of the top five most impactful threats in this year's World Economic Forum´s Global Risks report are related to climate change. The report warns that we are "sleepwalking to disaster" . But that is not true. The disaster is already here, it´s not something we are still walking towards. Climate change is no future threat, it´s a current one. We have entered a new phase, one in which the impacts are coming faster, with greater intensity. FELIPE CARRILLO PUERTO, Mexico, Jan 17 (IPS) - "I couldn't plant my cornfield in May, because it rained too early. I lost everything," lamented Marcos Canté, an indigenous farmer, as he recounted the ravages that climate change is wreaking on this municipality on Mexico's Caribbean coast. CAPE TOWN, South Africa, Jan 11 (IPS) - IPS Correspondent Yazeed Kamaldien speaks to DR. FRANK RIJSBERMAN, director-general of the Global Green Growth Institute (GGGI) about accessing finance for climate mitigation. While growth in the green economy looks promising, government regulation and a business-as-usual approach are among the hurdles inhibiting cleaner energy production. ZURICH, Switzerland, Jan 08 (IPS) - Peter Lüthi is in Communications at the Biovision Foundation for Ecological Development, Zurich. BULAWAYO, Zimbabwe, Dec 19 (IPS) - The changing climate and extreme weather events are affecting agricultural productivity in Africa to such an extent that a panel of experts are urging governments to prioritise and invest in irrigation to ensure food security. KATOWICE, Poland, Dec 14 (IPS) - As negotiations at the United Nations conference on climate change come to a close, the highest expectation is that finally, there will be a rulebook to guide countries on what should be done to slow down greenhouse gas emissions that make the earth warmer than necessary, and how countries can adapt to the impacts of climate change. Dec 14 (IPS) - It is close to curtain call for the United Nations' Climate Conference in Katowice, Poland, with ministers from around the world negotiating the text for a "rulebook" to implement the historic 2015 Paris Agreement for climate action. Amidst the various issues being debated, one of the most technical and complicated is Article 6 of the agreement, which focuses on the country plans for climate action. KATOWICE, Poland, Dec 12 (IPS) - Godefroy Grosjean is Asia Climate Policy Hub Leader, International Center for Tropical AgricultureUntil the United Nations climate talks in Bonn last year, no clear plan to include agriculture in climate negotiations existed. This was troubling, considering agriculture contributes 19-29% of global greenhouse gases, and changing temperatures are making it harder to farm. This is having an increasingly prominent effect on food security -- hunger levels have now risen for the third year in a row. As climate negotiators, experts and activists are gathering in Katowice, Poland, for the international climate talks, much of the focus will be on immediate issues. Laying down the ground rules of the 2015 Paris Agreement and wrapping up the first global review of countries' progress to date are high on the agenda. NAIROBI, Kenya, Dec 04 (IPS) - Robert Muthami is a Programme Coordinator at the Friedrich-Ebert-Stiftung, Kenya Office. He coordinates work around socio-ecological transformation. African countries have been at the climate-change negotiating table for more than 20 years. The continent faces some of the most severe impacts of climate change, but questions remain over its adaptive capacity despite this engagement. UNITED NATIONS, Dec 04 (IPS) - Patricia Espinosa was appointed Executive Secretary of the UN Framework Convention on Climate Change (UNFCCC) in 2016, a year after the adoption of the Paris Agreement to intensify actions and investments needed for a sustainable low carbon future. Prior to that, she was Minister of Foreign Affairs of Mexico.The IPCC report says that it is not impossible to limit climate change to 1.5͒C? Do you think we can realistically achieve that? Politically, what needs to happen? UNITED NATIONS, Dec 03 (IPS) - Lee Hoesung was appointed Chair of the Intergovernmental Panel on Climate Change (IPCC) in 2015. He is also the Endowed Chair Professor of economics of climate change, energy and sustainable development in the Republic of Korea*. Shah, Anup. “COP19—Warsaw Climate Conference.” Global Issues . 02 Dec. 2013. Web. 24 Apr. 2019. <http://www.globalissues.org/article/803/cop19-warsaw-climate-conference>.